I have shared this recipe many, many times and have even seen it crop up on other people’s blogs. I could make it in my sleep, but just on the off-chance that my brain reaches maximum capacity, I figured it was time to save it where I could find it. Put 270-280g water and 20g of oil in to the Thermomix, 37 degrees, 2 minutes, speed 1. Bring it together on Speed 6 for a few seconds, then put it on the knead cycle for 2 minutes. Rub a little oil into your hands, before removing the dough and shaping it into a ball. Then, either wrap it in a silicone mat if you have one, or spray the inside of a glass bowl with a little oil. Another trick is to turn a plastic vege freezer bag inside out, coat it with oil, turn it the right way around, then drop the ball of dough inside. Blow it up with air, like a balloon and tie the top in a knot. When the dough has doubled in size turn out on to a silicone mat and roll it flat, like a long sausage, about 15cm wide. Roll it up tightly, then either pop in a loaf tin, or lay it on a lined baking tray. Sprinkle the top with water, add sesame or poppy seeds if you so desire, then cover with a tea towel and put in a warm spot until suitably risen. Once it’s as high as you like, preheat oven to 200 degrees, cook for 30 minutes. Tip out on to a rack and admire. Remember, don’t cut your bread while it is hot! As tempting as it may be, you will let all the hot air out, which will cause it to become tough and doughy. 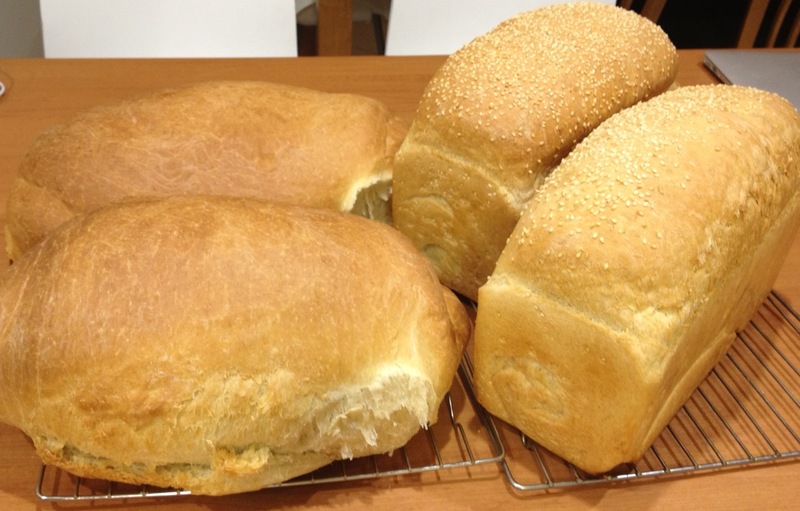 This entry was posted on Thursday, November 15th, 2012 at 8:35 pm	and tagged with bread, spelt, thermomix and posted in Food. You can follow any responses to this entry through the RSS 2.0 feed.